Built in 1909 as The Welcome Down-by-the-Lake, the Cleveland Inn stands at 5496 Lake Road, although its front is not visible from the road due to the arcade and other structures built onto/in front of it. Harvey Alden Spencer and his wife Irene Boomhower Spencer were the original owners and operators. They sold in 1913 to Mrs. N.A. Parker, who renamed it the Tuscar Inn. Under her ownership, the inn served chicken dinners, waffles and other home-cooked meals on Sundays. In 1920 Cleveland residents H.A. Kremer and his wife Lillie purchased the inn and renamed it “Cleveland Inn.” This was in keeping with a trend to name hotels after guest’s hometowns. A Pennsylvania Lodge and Youngstown Manor were already in place. According to a 1935 city directory, the inn offered 28 rooms. A brochure from the late 1920s featured the inn. 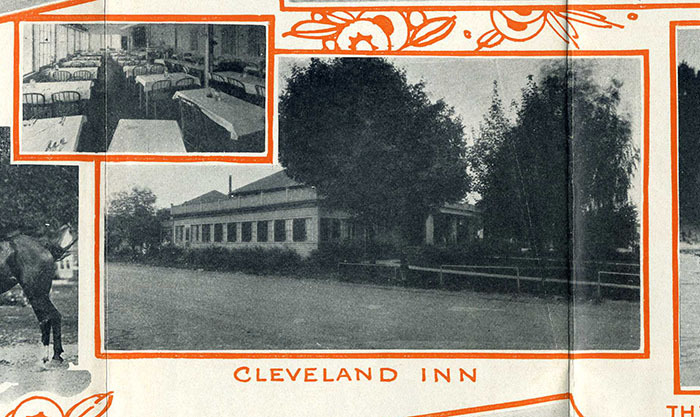 The Cleveland Inn as it appeared in the late 1920s. Don Woodward collection. This is a side view of the Inn, showing the large dining room that was added in the 1920s under the Kremers. Mr. and Mrs. Walter Banig Jr. purchased the inn in 1936 from the Kremers. Walter Banig Sr. purchased Land-of-Sands across the street to give Cleveland Inn guests beach access. In the summer of 1947, the Walter Banig family sold the Cleveland Inn and their Land-of-Sands across the street to Mr. and Mrs. Regner, who owned Crest Court. A week prior to announcing that sale, the Banigs purchased Maple Manor hotel, annex and cottages from E.V. Goettel. The Cleveland Inn property in 1947 included the hotel, three cottages (Happy Hours, Fl0-Walt and Mary-Pop), a garage and two parking lots. The Land-of-Sand package included four cottages and the Banig winter home. Regner had no plans for the property. In April 1954, Regner sold to Mr. and Mrs. Joseph Miller, who owned Chapman’s Diner and Cocktail Lounge in Geneva. The Millers planned to specialize in complete home-cooked dinners. The location was at the corner of Spencer Avenue and the south side of The Strip. 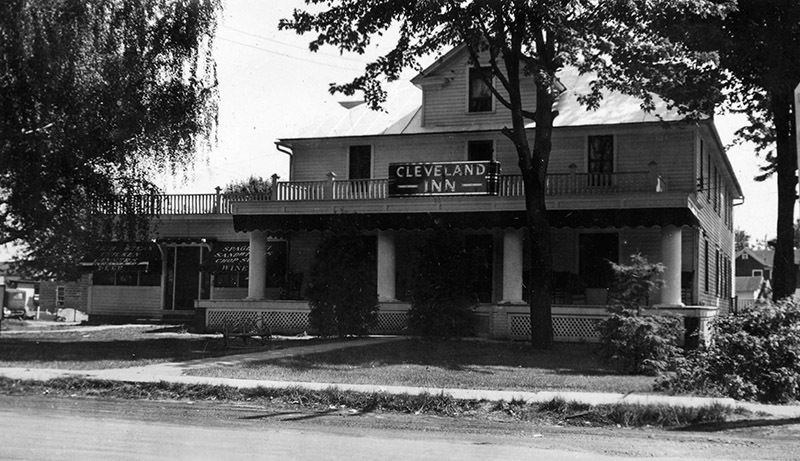 The Cleveland Inn as it appeared in the late 1930s. Star Beacon collection. The Millers operated the restaurant and inn for several years, then built the game arcade, Joe’s Fun House, and converted the inn to apartments. This video features an interview with the children of the last owners, Joe and Alice Robinson, to run the restaurant and inn, during the 1950s.